Eric Drysdale and Gary Locke. Raith Rovers chief executive Eric Drysdale has urged any disgruntled supporters to get behind Gary Locke after insisting the former Kilmarnock and Hearts boss is the right man to challenge for a Premiership place. Locke was handed a two-year contract by the Fifers to replace Ray McKinnon on Friday, prompting some fans to criticise the appointment on social media and online messageboards. However, Drysdale has no doubt the Rovers board have got the right man for the job and is adamant Locke will carry on the stellar work done by his predecessor. He said: “The supporters enjoyed last season under Ray McKinnon and the board is very confident Gary can continue that trend and maintain that momentum. “It is important all the supporters – whether in favour of the appointment or not – get behind the new manager, because this is our club and he is here to do the very best for Raith Rovers and we all need to be pulling together. 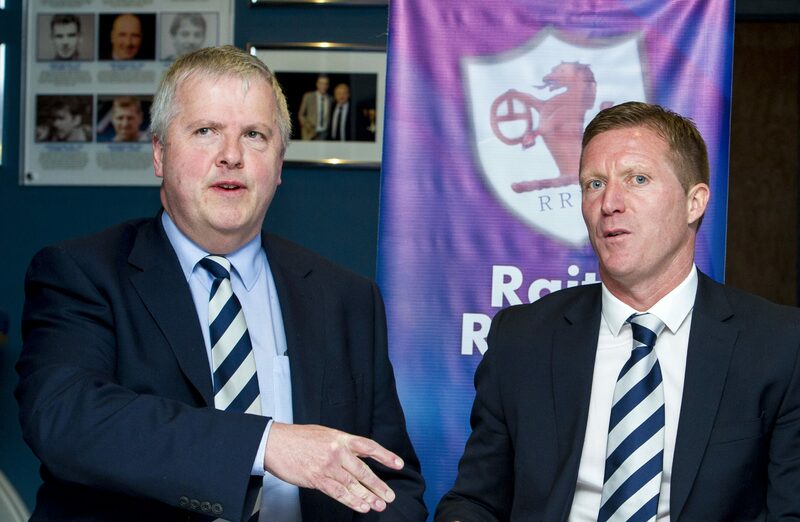 “Gary’s coaching level at Premiership level stood him apart from many of the candidates – because what we are looking to achieve from this appointment is to take Raith Rovers forward and to eventually become a top flight team.